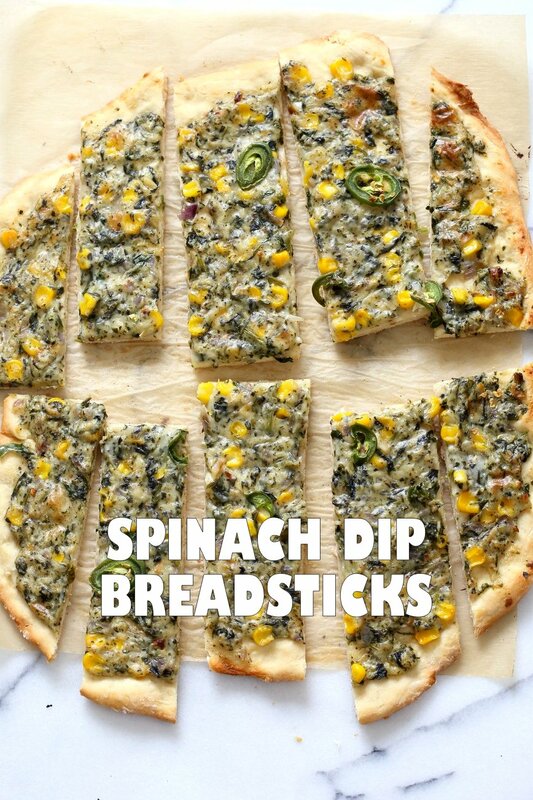 Vegan Spinach Dip Breadsticks. 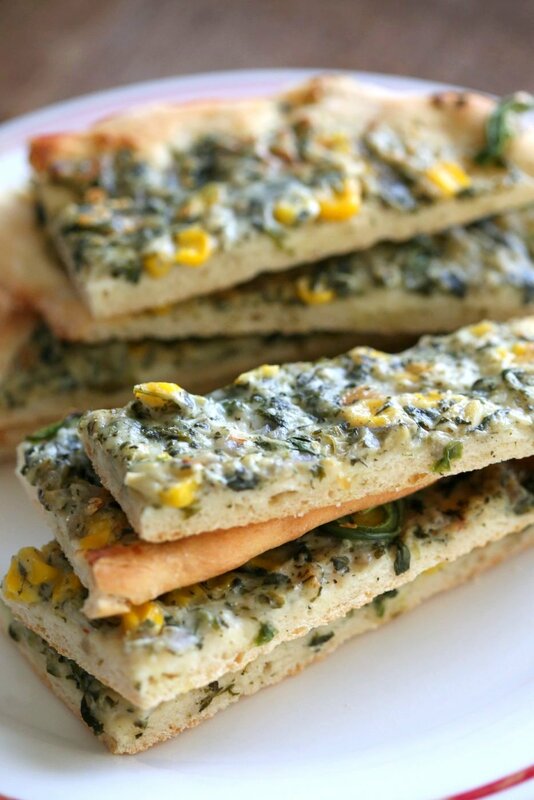 Creamy Corn and Spinach dip spread over pizza crust or puff pastry, bake, slice and serve. Easy Vegan Recipe. Can be gluten-free if served as a dip. Anywho, Game or not, these Breadsticks are a fab snack or side. 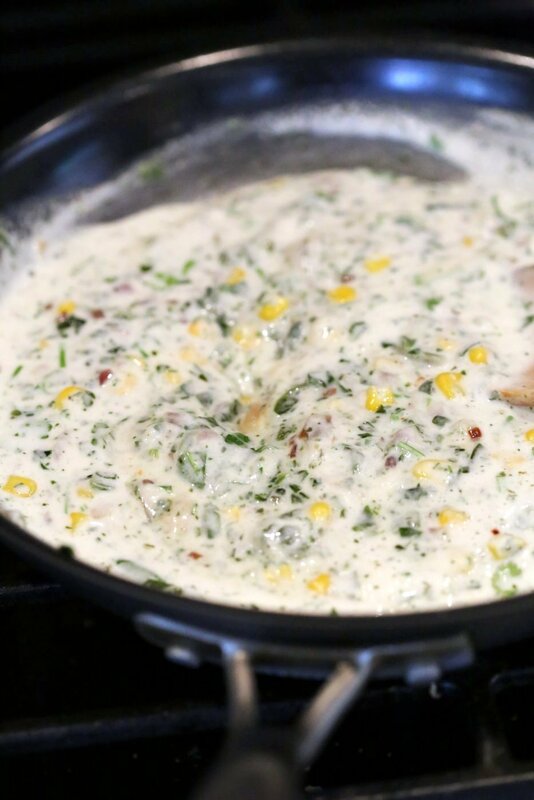 The spinach dip is made in a skillet on the stove top. It comes together really quickly. It is hard to keep some aside to make these bread sticks! I added some corn for volume. 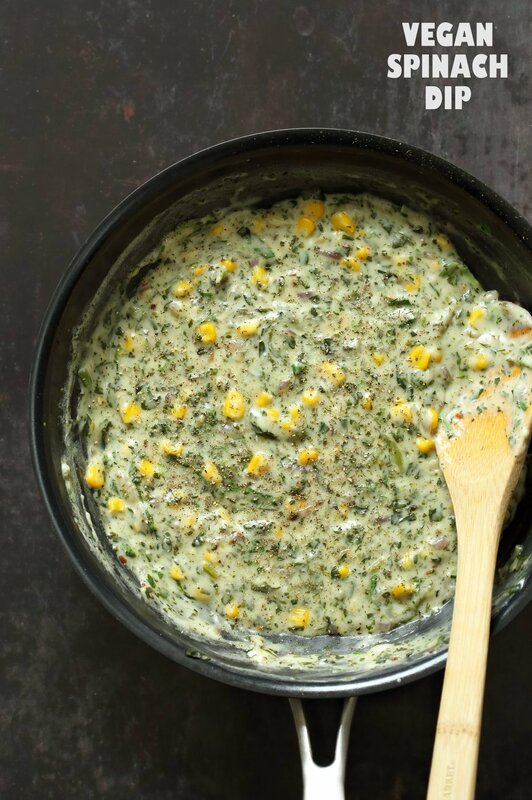 You can serve the dip directly off the skillet with some vegan Parmesan or spread it over pizza crust or puff pastry, bake, slice and serve as bread sticks or slices. If you make this dip or the bread-sticks, let me know how they worked out. Pizza dough or puff pastry can be shaped in various formats, Get creative with the presentation with twists, stuffed bites, pinwheels etc. Part of my kitchen and home are out of commission for a few days because of a water leak that soaked up through one of the rooms entire floor and then dripped from the living room bulb fixture. Now that was one interesting rainy day. Oh hey, I do have the Instant pot to set up kitchen elsewhere, so we are good (except those humongous loud fans). 1 Recipe Easy Pizza crust or 2 puff pastry sheets. Heat oil in a skillet over medium heat. Add onion and garlic and cook for 4 minutes, stirring occasionally until translucent. 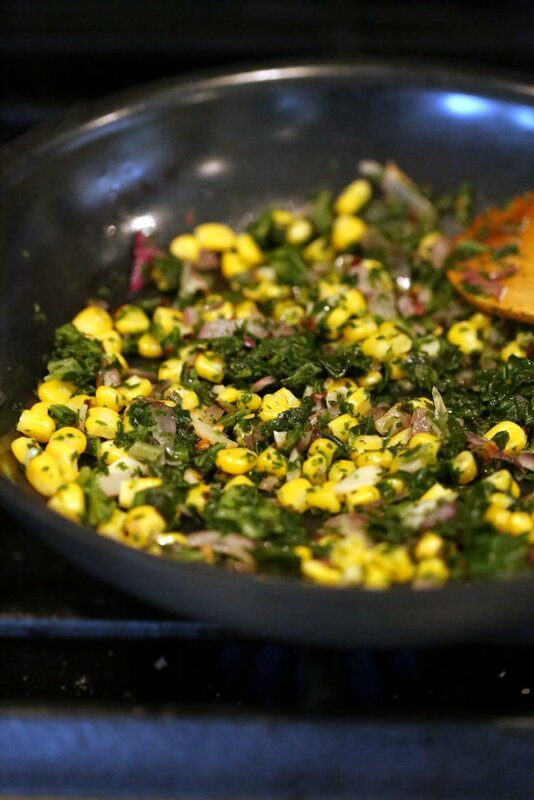 Add spinach, corn and pepper flakes and mix in. Cook for 4 to 6 minutes. (I use frozen spinach directly from the freezer, fresh will cook faster). Add the mixture to the skillet. Sprinkle in the dill, chives/parsley and black pepper and mix in. Bring to a boil to thicken. Taste and adjust flavor. Cook for another minute stirring continuously then take off heat. At this point this dip can be served as is. Or transfer to a bread bowl and serve warm-hot with a sprinkle of vegan parm on top. To make breadsticks, Prep your pizza crust and roll it out into somewhat rectangle or use thawed puff pastry sheets. Spread the warm/cool (not hot) dip over the crust. Add jalapeno or other sliced veggies or veggie sausage or other toppings. Bake at 425 degress F(220 deg C) for 17 minutes. Remove from the oven and let it sit for half a minute. Slice into breadsticks and serve! For variation: Use other greens as baby kale, chard etc. Add chopped artichokes for a Spinach Artichoke dip. Add beans or peas instead of corn. 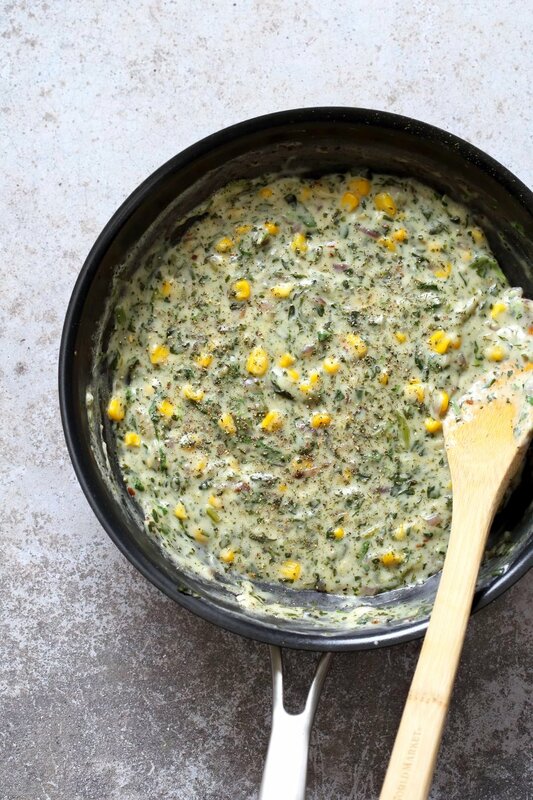 To make this gluten-free, serve as a dip with veggies, or use gluten-free pizza crust. To make this cashew-free, use macadamia nuts, silken tofu, pumpkin seeds or boiled cauliflower. I am allergic to cashews. May I use vegan sour cream in place of the cashews? If so, how much? Love this idea and will make it for a Sunday family gathering appy! Perfect! Love your creativity and your blog. This looks delicious Richa! So sorry to hear about your leak. I agree with you – those fans are soooo loud Good luck. Thanks for the recipe idea. I will try it for our super bowl party. Sorry to hear about your leak. Hope you get your house back to normal quickly. Thank you. Let me know how it turns out! Hi Richa! I made the dip yesterday for a Super Bowl party , and it was a SMASH HIT!! Brilliant recipe! Thanks so much! This looks amazing to say the least. Recently changed me diet so I appreciate this recipe.